Spade & Archer by Joe Gores, a Mysterious Review. Review: Joe Gores takes on the risky project of penning a prequel to The Maltese Falcon, Dashiell Hammett's mystery introducing Sam Spade, with Spade & Archer, chronicling some of the early cases of the famous private eye. In 1921 — some seven years before the events that take place in The Maltese Falcon — Sam Spade resigns his position as a Seattle-based investigator for the Continental Detective Agency. Moving south to San Francisco, he sets up an independent agency as "Sam Spade, Esq. ", which is quickly shortened to just "Sam Spade" after his new receptionist, Effie Perine, says it seems "more elegant". He's open to about any case, but no domestic matters. His buddy Sid Wise, a lawyer, is a source for new clients, and Spade hits his stride when a missing persons case is referred to him. Posing as a shipyard inspector, he's drawn into a separate case involving a fortune in stolen gold. The two cases are solved nearly simultaneously, setting him up for bigger and better (those are relative terms) things. "[The police and the detectives] are thinking big and complicated. I'm thinking small and simple." He touched a finger to the tip of her nose. "Simple is always best, sweetheart." The overall tone to the book isn't quite as dark and noir-ish as one might expect, the chapter titles deftly adding a light, entertaining touch, but it is certainly written in the style of Hammett and quite enjoyable. 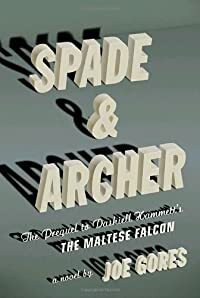 Fans of The Maltese Falcon and its author can rest assured that all due respect was paid to the original, and will not be disappointed with Spade & Archer. Acknowledgment: Random House provided a trade paperback edition of Spade & Archer for this review.